In the jewelry world, there are countless gemstones vying for attention. You can’t deny the allure of rubies, sapphires, and emeralds, but they can be found in many places. Helenite, the verdant green stone called “America’s Emerald” can only be found one place on earth, in the great Pacific Northwest. On May 18, 1980, when the once-slumbering Mount St. Helens erupted, scorching over 230 square miles of land, it was one of nature’s most impressive displays of power. But even more impressive was the secret the volcano had been hiding. From that chaos and destruction, something beautiful emerged…a spectacular new creation named Helenite. 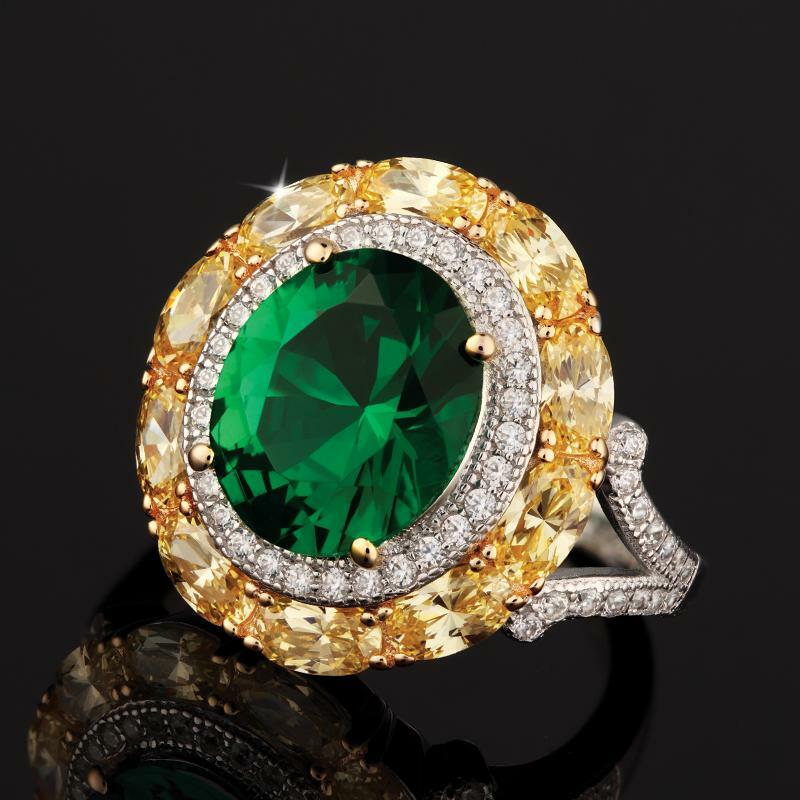 Born of ancient minerals that erupted from inside of Mount St. Helens, this brilliant green creation has captured the attention of jewelry designers worldwide. We believe this American beauty is worthy of being crowned the reigning stone of the United States, so we are honored to bring you America’s prized helenite in a ring of spectacular beauty. The verdant green of a perfect oval-cut helenite stone glows clear and bright amid 58 sparkling white lab-created DiamondAura® rounds and 10 intensely yellow DiamondAura ovals. Our signature diamond look-a-like create a crown worthy of helenite’s verdant green splendor. This is the ring to let your beauty queen know she’s your reigning champion.